The greatest touch table of the world is on its way! 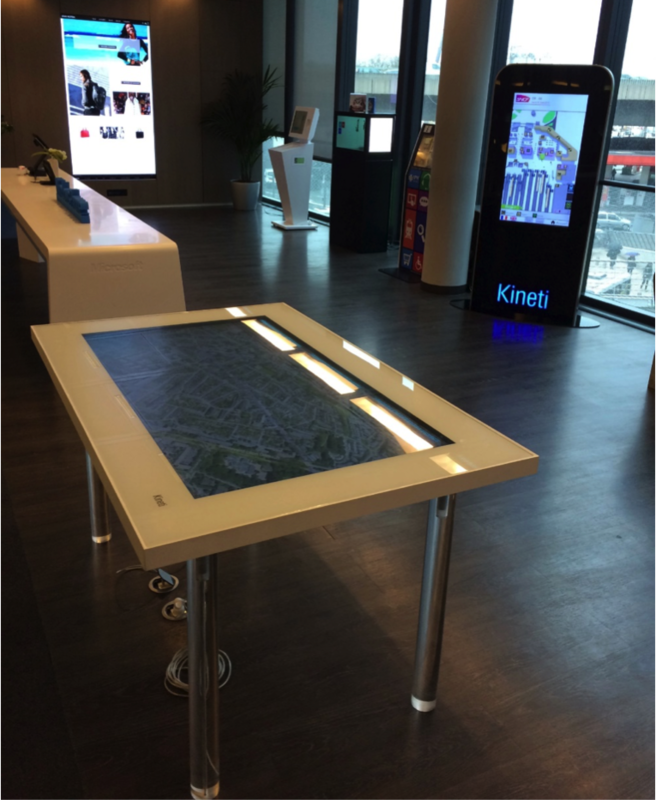 Kineti’s teams have been working the past 7 years to create a working touch table. Good news, now it is exists and it works! We have now the ambition to deliver to the world the greatest touch table you could expect, and that is why we need you today! We now need to know what you would love it to do in order to improve what we’ve done so far. Let us build the future! One night in 2010, I was with friends having a laugh and chatting around a table. And along the discussion as usual we showed each other google searches, images or videos to each others thanks to our smartphones and tablets. And this was not convenient at all as I had to show to my friends one after the other. And that is at this exact moment we thought it would be great if the wooden table we were sited around could become a giant tablet where we could share and see anything we like. That would be a huge challenge! We were all very excited and we decided to take it. And then for 2 years, we made some research and development in our garage with a lot of friends, engineers and specialists to see if we could come close to what we could call a touch table! And guess what? After 2 long years, YES! We made it! Anyway, it was working but was nothing greatest than a poor proof of concept. We continued then to spend time and money to improve it. Finally, After one more year, in 2013, we can say we succeeded. YEAAAAH! Finally, we had a strong table where we can put anything on it with a great touch interaction. And during that time, we also realized that two small players was in our game. Guess who? Do not worry too much they are tiny!......Ready? Microsoft and Samsung!!! DAMN! We thought the game was over and we could forget our dream to deliver to the world a nice touch table to do TOGHETHER what we all do alone with smartphones and tablets. And, I have to reckon we were impressed! But by their building and not by their touch table! ;o) It actually was working as our first version but as our great surprise our V2 was much better. The dream is back!. And then to make a long story short, after some time in 2013, they called us back and offered us the possibility to have our V2 touch table in their showrooms in Paris and Dubai in their Microsoft Technology Centers (M.T.C. for the Micrsoftees). This has been a great and strong greatfullness sign for us! Since then, a few others have appreciated our work and offered us some very nice prices. This is how we get come to toaday, and now we need you, we need your help to pursue this great adventure, we need to have a better understanding about what you expect from such a touch table. Help us to deliver to the world the best touch table ever! to invent the best ever touch Table!